The play functions are where this model truly shines. The truck smoothly loads and unloads the silo thanks to a motorized pneumatic system. When unloading or unloading, the model has powered, extendable and retractable stabilizer “feet” to steady the truck. 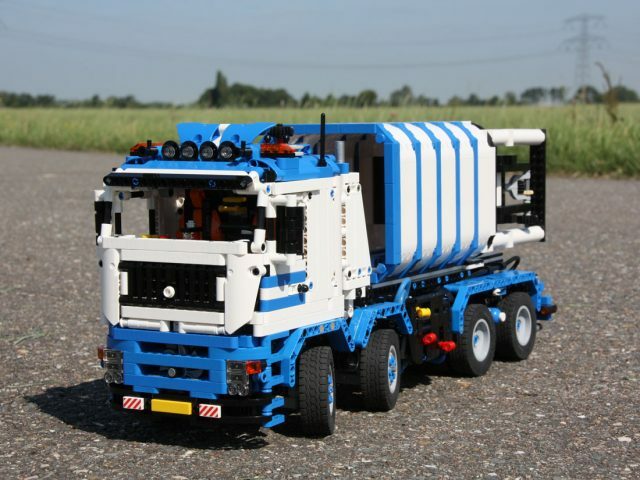 In addition, the truck’s cab tilts open to reveal the chassis and mechanisms underneath. The silo itself has some play functionality, as you can fill it up with small 1×1 round studs and turn a crank to bring them tumbling out like rocks from a sifter. See Designer-Han’s site for more details and the option to buy instructions!